What are all these new safety features I’m hearing about? 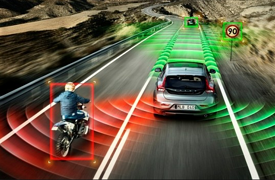 New safety technology in cars is advancing so quickly that it can be hard to keep up with all the changes. Well, we’re here to help with our “Your Car Can Do What?” blog series. Forward Collision Warning- Sensors have been placed in the front of cars with this feature. The sensors detect cars, and in some cases objects, in front of you and will alert you in case you are too close to the car. This feature is only to alert drivers of a potential hazard and should no be relied on to completely prevent a collision. Lane Departure Warning- This alert system, with the use of roadway markings, will give a visual, vibration, or sound warning if your vehicle drifts out of its lane. If you use your signal, this feature will know that moving outside of the markings was purposeful. Make sure you are aware of your surroundings when driving and always use your turn signal when moving around in traffic. Be on the lookout for our next article in our Your Car Can Do What series on new automotive safety technology!